Almost all travellers to Fiji will pass through the international airport in Nadi, which is the third largest urban area in Fiji islands. Pronounced ‘nahn-di’, Nadi is a busy and vibrant tourism hub, offering immediate access to many of Fiji’s most popular destinations, and featuring a wide array of local sights and attractions. Get your adrenaline pumping at Sleeping Giant Zip Line’s 35-acre eco-friendly adventure park, or enjoy drinks with friends at popular nightlife spots. Catch a ferry at Denarau Port and visit the Yasawa and Mamanuca islands off the coast, or if shopping is your scene, visit the Town Market in Nadi. Hotel Novotel Nadi is just a short shuttle ride from the airport, and no more than 15 minutes to Port Denarau where you can catch boat transfers to the islands. 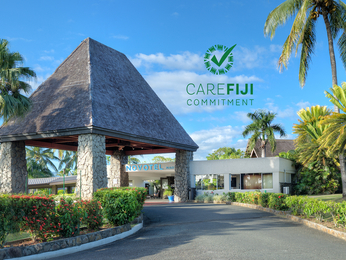 Situated on 42 acres of tropical gardens, with every room overlooking the golf course and picturesque landscape, Novotel’s Nadi accommodation is the perfect place to base yourself during your Fiji island holiday.